According to a new report published today, the Apple iWatch will start production in July. A source familiar with Apple's plans says that the timepiece will be equipped with a 2.5 inch screen that is "slightly" rectangular in shape. That conflicts with other reports that said that the wearable would have a circular screen. The watch face will protrude from the band, forming an arch. The Apple iWatch will feature a touch screen and will also support wireless charging. 50 million units are expected to ship in the first year. 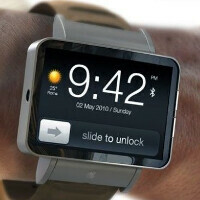 Like many of the smartwaches we've seen hit the market so far, the Apple iWatch will require a smartphone to pair with. In this case, the watch will need to sync with an iPhone in order to handle messaging and voice calls. Some capabilities can be handled by the watch itself, such as the sensor on the device that will measure the user's pulse. The glass for the initial run of the device, is made by LG Display. The Apple iWatch is currently in trial production at Quanta, and the contract manufacturer will account for 70% of the assembly of the timepiece. While the current line-up of smartwatches hasn't blown away the consumer with their capabilities, many are hoping that the Apple iWatch is as much a game changer to the industry as the iPhone was to the smartphone business when it was launched in 2007. Yes, the whole industry should watch out for the iWatch! Not if it has a 2.5 inch screen. This is the only watch product i actually expect to be good. You could just tape your current iPhone on your wrist for same effect, err at least get accustomed to screen size I guess. Looks about as functional too, so double win. I don't hate apple per sa. Just Mxy and a few other trolls. I've been an Android and Apple user for quite some time, so I've had my share of stuff. Not to mention all my friends (literally, all of them) have iPhone. Never do I hear or see other Apple users or employees doing these accusations you and others on this site always claim. Moto 360 is the only REALY SMART watch that actually looks like a watch. As big as their phones? Compensating maybe. Or just making sure the battery lasts a month between charges? Im just going to wait on the gear 3 with android wear that comes out with the note 4.
iWatch, 5.5 iPhone 6 will be mine this fall. The jedster is rocking the goods. Bro, I'm so in line for this falls lineup. Coffee and snacks lol. A lot of Apple stores walk around the lines with a big food cart giving away snacks and coffee. My first launch even in line was for the 5s, and it was very very fun! Man, that's cool. I've never done it at Apple, might be the year to try. I always go to At&t. I hear rumors that Apple is making a special ankle bracelet version for law enforcement, so richer criminals won't feel the stress of having to wear some generic ankle bracelet running "Android CrimeWear". Seriously hope it isn't a 2.5" screen and rectangular. I may as well strap my 4S to my wrist in that case, way too big. You actually want it rectangle. This actually proves to me that it will be curved/flexible. It's 2.5 inches diagonal. The width still can be thin. For example, the current iPod nano has a 2.5 inch screen. Imagin that curved around the top of your wrist and you will get a good idea. No, I really dont want it rectangle, I don't like rectangle watches as much as circular watches. And since it is a watch, it is a fashion piece first and foremost. That 2.5" screen on the nano is still huge compared to most wrists, and it being curved around your wrist will make it both uncomfortable for many people with big or small wrists, and also mean there is a bunch of useless screen real estate that you won't be able to see easily without twisting your wrists around in uncomfortable ways. If it is rectangular, I'm sure apple would do it similar to in the picture. And 2.5" screen that way is just comically large. Form and UX reign supreme with Apple, and this rumor just sounds like an awful idea. I can see them doing rectangular, though I think circular is more their style, I can't see them doing it with a screen this large. I wonder if all the usual suspects who say that holding a Note to your head for a phone call looks ridiculous will say that a 2.5 inch watch on your wrist looks silly. Why do I have a feeling they won't?